The Green Sanctuary: What Is Lymphoma ? Lymphoma is a cancer of the lymphatic system. The lymphatic system carries lymph fluid and white blood cells throughout body. The purpose of the lymphatic system is to fight infections. Like all cancers, lymphoma happens when the body's cells grow out of control, often causing tumors to grow. Most lymphomas are made up of white blood cells called either T cells or B cells. Lymphoma cells are sometimes found in the blood, but tend to form solid tumors in the lymph system or in organs. These tumors can often be felt as a painless lump or swollen gland almost anywhere in the body. 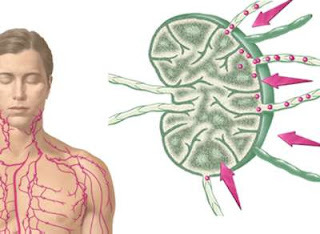 The lymphatic system helps to filter impurities, bacteria, and viruses from the body. 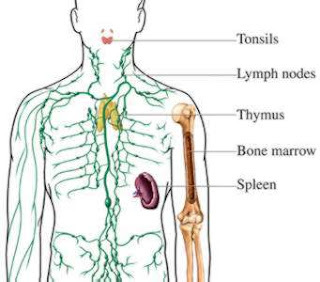 The lymphatic system is made up of the lymph nodes [Small, bean-shaped organs located throughout the body along the vessels of the lymphatic system. The lymph nodes filter impurities from the body and store white blood cells that fight infection and other diseases. Clusters of lymph nodes are found in the underarms, groin, neck, chest, and abdomen. Also known as lymph glands], spleen [An organ that is part of the lymphatic system. The spleen produces lymphocytes, filters the blood, stores blood cells, and destroys those that are aging. It is located on the left side of the abdomen near the stomach], and special tubes that extend throughout the body like blood vessels. Swollen glands are actually enlarged lymph nodes. Lymph nodes act as alert centers which activate the immune system to attack viruses, bacteria, or other foreign substances. Hodgkin's lymphoma, also known as Hodgkin's disease, is a specific form of lymphoma. The cancer cells found in Hodgkin's disease have traits that differ from other lymphomas. Unlike other forms of lymphoma, Hodgkin's disease usually spreads in a predictable way from one lymph node region to the next. Hodgkin's disease tends to respond differently to treatment than does non-Hodgkin's lymphoma. Non-Hodgkin's lymphoma includes many different cancers of the lymphatic system. Lymphomas are identified according to what type of cells they contain or where they occur in the body. Most non-Hodgkin's lymphomas are found in the lymph nodes or lymphatic organs. Lymphatic tissues and cells are found throughout the body. So, lymphomas can also develop in the liver, stomach, nervous system or in other organs. The cause of most lymphomas is not known. Most are probably caused by mutations in certain genes, called oncogenes, which then allow normal cells to divide out of control. * Exposure to chemicals such as certain solvents, pesticides, herbicides, and water contaminated with nitrate. * Taking drugs that suppress the immune system. * Having an autoimmune disease [A disease in which the immune system attacks body's own tissues], such as lupus or rheumatoid arthritis. * Having stomach ulcers or gastritis caused by a kind of bacteria called H. pyelori. * Having a weakened immune system. For example, people with AIDS are 50 to100 times more likely to develop lymphoma than people who are not infected with the AIDS virus. * Having one of the viruses that may increase risk for some types of lymphoma. For instance, in Africa, most Burkitt's lymphoma cells also carry the Epstein-Barr virus (EBV). In the United States, however, most Burkitt's lymphoma cells do not carry EBV. Viruses called HTLV-I appear to cause lymphoma in Japan, the Caribbean, and the southeastern United States. Another virus, called HHV-8, has been found in most cases of body cavity-based lymphomas (BCBL). What Are The Symptoms ? The first sign of lymphoma is often a painless lump or swollen gland in the neck, abdomen, underarm, or groin area. Lymphomas are often discovered during a visit to the doctor for another reason, or during a routine physical exam. * Red patches on the skin. * Nausea, vomiting, or abdominal pain. * Unexplained weight loss, usually more than 10% of total body weight. * Fever of more than 100 degrees Farenheit, which can come and go, especially in the evening. * Itching skin, usually without a rash. Having these symptoms does not necessarily mean that a person has lymphoma, but if these symptoms last longer than two or three weeks, you should see a doctor. What Are The Different Types Of Lymphoma ? There are many different types of lymphoma. Researchers continue to seek better ways to group lymphomas so that doctors can predict the best treatment for a particular type of tumor. In most cases the type of lymphoma is less important than the grade and stage of a particular lymphoma. * The appearance or histology of the cancer cells under a microscope. * What kinds of genetic mutations they carry. * Whether they form tight clusters (nodular) or are spread throughout a lymph [The almost colorless fluid that travels through the lymphatic system and carries cells that help fight infection and disease] node or other organ of the body (diffuse). * What type of cell they arose from. * What types of proteins the lymphoma cells have on their surface. * Where they occur in the body. Many types of lymphoma have traits that overlap with one another so it is often difficult to group them into definite categories. Also, many lymphomas that begin as one type gradually develop into another. * Lymphoblastic lymphoma (LBL) - This form occurs more often in children than adults, and accounts for about 30% of all lymphomas in children. It is an aggressive, fast-growing form of lymphoma. In the past, it has been fatal for many patients. Today, intensive chemotherapy [Treatment with anti-cancer drugs] has greatly improved the chance of surviving LBL. * Burkitt's lymphoma - This form of lymphoma has been found in Africa, where infection with Epstein-Barr virus may play a role in its cause. Burkitt's lymphoma is also seen in other parts of the world, but in most of these cases a virus doesn't seem to be involved. Burkitt's usually causes a large tumor either in the bone of the jaw, or in the abdomen [The center part of the body that contains the stomach, intestines, liver, gallbladder, and other organs]. * Diffuse histiocytic lymphoma (DHL) - Also called reticulosarcoma, this type of lymphoma is made of a substance that is more like connective tissue [The type of tissue that makes up the supporting structure of the lymph nodes and other organs, in the same way that beams and girders make up the supporting structure of a building] than white blood cells [The cells of the immune system that fight infection, attack foreign substances or cells, and sometimes kill cancer cells]. DHL is usually slow-growing, hard to treat, and often returns after treatment. * Cutaneous T-cell lymphoma (CTLC) - Also called mycosis fungoides [another name for cutaneous T cell lymphoma (CTLC), which affects the skin] or Sezary syndrome, this kind of lymphoma affects the skin. In CTLC, white blood cells in the skin become cancerous and eventually cause tumors to form. This form tends to grow slowly over many years. In the early stages of CTLC, the skin may develop dry, scaly, red or dark patches and begin to itch. Eventually, raised tumors form on the skin. When the cancer becomes more advanced, it may spread to the blood, and from there to other organs. In addition to the therapies used for other types of lymphoma, two additional treatments are used for CTLC. One is phototherapy [A treatment in which a drug that makes cancer cells sensitive to light is given to the patient, and a special light is then shone on the cancer cells to kill them], in which a drug that makes cancer cells sensitive to light is given to the patient, and a special light is then shone on the cancer cells to kill them. The other treatment is total skin electron-beam radiation therapy [A form of treatment that uses high-energy radiation from x-rays, neutrons, and other sources to kill cancer cells and shrink tumors] or TSEB, in which the entire surface of the skin is exposed to radiation. Today, treating CTLC often causes the cancer to disappear, or go into remission [Disappearance of any sign of cancer cells and all symptoms of cancer. When this happens, the cancer is said to be in remission. A remission may be temporary or permanent], but it is a very difficult cancer to cure if not caught early. Treatment does help the symptoms, however, and can often increase a patient's life. New combinations of therapies are being studied in the hopes that more cases can be kept in remission for a longer time. * Lymphoplasmacytoid lymphoma (LPL) with Waldenstrom's macroglobulinemia - LPL develops when special white blood cells called plasma cells [White blood cells called B cells that have been triggered into make antibodies] begin to divide out of control, becoming cancerous. It is a slow-growing or indolent form of lymphoma. LPL cells also release too much of a kind of antibody [Antibodies are proteins that help white blood cells fight off viruses and bacteria, by binding to foreign invaders and signaling the immune cells to attack] called IgM into the blood. This condition is called Waldenstrom's macroglobulinemia. In addition to the cancer, this is dangerous because it causes a thickening of the blood. This in turn can cause fatigue, headaches, weight loss, visual problems, confusion, dizziness, loss of coordination and excessive bleeding. If not treated, the thickened blood can tax the heart so much that it leads to heart failure. How Is Lymphoma Diagnosed ? If a person has symptoms of lymphoma or notices a lump or swelling, the doctor will perform a complete physical exam. This includes checking the lymph nodes [Small, bean-shaped organs located throughout the body along the vessels of the lymphatic system. The lymph nodes filter impurities from the body and store white blood cells that fight infection and other diseases. Clusters of lymph nodes are found in the underarms, groin, neck, chest, and abdomen. Also known as lymph glands] in the neck, armpit, or groin [The area in the body where the thigh meets the abdomen], and checking for an enlarged liver or spleen [An organ that is part of the lymphatic system. The spleen produces lymphocytes, filters the blood, stores blood cells, and destroys those that are aging. It is located on the left side of the abdomen near the stomach]. The doctor will ask about recent illnesses or infections, and overall health. Blood tests may rule out infections and other types of disease. The blood will also be checked to see if cancer [A disease in which any of the body's cells begin to divide out of control, causing a tumor to form or too many of these cells to spread throughout the body] cells or cancer-related enzymes are present. Other factors in the blood, such as anemia [Too few red blood cells. Anemia can cause tiredness, shortness of breath, and make it harder for the body to fight infection. may be looked at]. These tests may also provide information on how far the cancer has spread. * CT (computed tomography) scan. * MRI [Magnetic resonance imaging. A procedure in which a magnet linked to a computer is used to create detailed pictures of areas inside the body] (magnetic resonance imaging) scan. * Lymphangiogram [X-ray of the lymphatic system. A dye is injected into a lymphatic vessel and travels throughout the lymphatic system. The dye makes them visible on the x-ray], a test using a special dye that makes the lymph nodes and vessels show up on an x-ray. A biopsy tells whether a lump or swollen gland is truly a lymphoma. To do a biopsy, the doctor will surgically remove a small sample of tissue, and a pathologist A doctor who identifies diseases by studying cells and tissues under a microscope. looks at it under a microscope. Cancer cells look a certain way under the microscope, which allows the pathologist to identify them. Infections like the flu, mononucleosis (mono), or strep throat can also cause swollen lymph nodes, so these symptoms should not automatically cause concern of cancer. If the swelling does not go down after a couple of weeks, you should see a doctor. Swollen lymph nodes due to infection are usually fairly soft and somewhat tender or painful, while cancerous nodes are usually firm, rubbery and painless. Certain chemicals or medications, such as antibiotics and drugs for epilepsy, can cause swollen lymph nodes and other symptoms that may resemble symptoms for lymphoma. To avoid this confusion, tell your doctor what medications you have been taking recently. There are other serious conditions that can cause swollen lymph nodes. These include AIDS, other types of cancer, and disorders of the lymph [The almost colorless fluid that travels through the lymphatic system and carries cells that help fight infection and disease] system that are not cancer. The tests described above will help to rule out these conditions. What Are Grading And Staging ? When a doctor has found cancer cells and is sure that they are from a lymphoma, it is important to know the grade and the stage of the cancer. Lymphomas of different grades and stages grow at different rates, and respond differently to treatment. * The grade of a lymphoma refers to how quickly, or aggressively, it is growing. * The stage of lymphoma or any cancer depends on how far it has spread throughout the body. * Grade and stage are the most important factors for predicting how a patient will do and for deciding on the best treatment. * Low-grade or indolent : slow-growing lymphomas that can go for many years without treatment. * Intermediate-grade or aggressive : faster-growing lymphomas. * High-grade or highly aggressive : very fast-growing lymphomas. In order to decide on the best treatment, it is helpful to know what stage the cancer has reached. The stage describes how far it has spread through the body from where it began. Lymphomas are grouped into four stages, from Stage I to Stage IV. Stage IV is the most serious. The stage and whether the cancer has spread or remains as a single tumor [An abnormal mass of tissue that occurs when cells divide out of control. Tumors may be either benign (not cancerous) or malignant (cancerous). Benign tumors do not spread throughout the body and when they are removed they do not grow back. Malignant, or cancerous, tumors may do both] is more important for slow-growing, low-grade lymphomas than for the more aggressive high-grade tumors. * How many lymph nodes [Small, bean-shaped organs located throughout the body along the vessels of the lymphatic system. The lymph nodes filter impurities from the body and store white blood cells that fight infection and other diseases. Clusters of lymph nodes are found in the underarms, groin, neck, chest, and abdomen. Also known as lymph glands] contain cancer cells and where are they located. * Whether the disease spread to the bone marrow [The soft, spongy tissue in the center of large bones that produces white blood cells, red blood cells, and platelets] the spleen [An organ that is part of the lymphatic system. The spleen produces lymphocytes, filters the blood, stores blood cells, and destroys those that are aging. It is located on the left side of the abdomen near the stomach], or to other organs outside the lymphatic system [The tissues and organs that produce, store, and carry white blood cells that fight infection and other diseases. This system includes the bone marrow, spleen, thymus, and lymph nodes and a network of vessels that carry lymph and white blood cells into all the tissues of the body]. * A bone marrow biopsy [The removal of cells or tissues for examination under a microscope] to show whether the cancer has spread into the bone marrow. To do a bone marrow biopsy, a doctor removes a sample of bone marrow through a needle inserted into the hip or another large bone. * A CT scan [Computed tomography scan. A series of detailed pictures inside the body; the pictures are created by a computer linked to a special x-ray machine. Also called a CAT scan] or lymphangiogram [X-ray of the lymphatic system. A dye is injected into a lymphatic vessel and travels throughout the lymphatic system. The dye makes them visible on the x-ray]. * Taking samples from other tissues, such as the liver or stomach, to see whether tumor cells are present. * Sometimes, a doctor may want to do an operation called a laparotomy to look for additional tumors. During a laparotomy, a surgeon takes samples of tissue from inside the abdomen [The center part of the body that contains the stomach, intestines, liver, gallbladder, and other organs. . If a CT scan can be done, a laparotomy is usually not necessary. Results from a CT scan are usually considered more accurate]. * Depending on where cancer cells or tumors are found, other tissue samples and tests may need to be done. * Stage I : A single tumor which hasn't spread. * Stage II : More than one tumor, but the tumors are all found in lymph nodes on the same side of the diaphragm (all above or all below). Stage II can also mean that a tumor has spread to another organ, but that it is close to the original lymph [The almost colorless fluid that travels through the lymphatic system and carries cells that help fight infection and disease] node tumor. * Stage III : More than one tumor with the tumors found on different sides (above and below) of the diaphragm. There may be tumors in the spleen or more than one tumor in nearby organs. * Stage IV : Many tumors spread throughout an organ such as the liver or stomach, as well as in the lymph nodes. Stage [A measure of how far a cancer has spread throughout the body. Stages range from Stage I, which is a localized tumor that has not spread, to Stage IV, in which the cancer has spread to parts of the body far away from the original tumor. Stage I cancers have a better outlook than do Stage IV cancers] IV can also refer to a single tumor in another organ, plus tumors in distant lymph nodes. What Treatments Are Available For Lymphoma ? The combination of drugs and therapies used will depend on the type of lymphoma. Chemotherapy is the use of drugs to kill cancer [A disease in which any of the body's cells begin to divide out of control, causing a tumor to form or too many of these cells to spread throughout the body] cells. Chemotherapy for non-Hodgkin's lymphoma usually includes a combination of several drugs. Radiation therapy uses high-energy x-rays to kill cancer cells and shrink tumors. Chemotherapy and radiation therapy are the most common treatments for non-Hodgkin's lymphoma. Because of the risk that a lymphoma has spread beyond the original tumor [An abnormal mass of tissue that occurs when cells divide out of control. Tumors may be either benign (not cancerous) or malignant (cancerous). Benign tumors do not spread throughout the body and when they are removed they do not grow back. Malignant, or cancerous, tumors may do both], surgery alone isn't usually enough. Chemotherapy is called a systemic treatment because the drugs travel throughout the body. This means that even those cancer cells that have not yet been found may be killed. Patients may receive chemotherapy alone or in combination with radiation therapy. Bone marrow may be taken from the patient before chemotherapy begins and given back to the patient after treatment is done. Or, bone marrow from another person may be used. We now understand a great deal about cancer and the body's defense systems. Biological theraphy [Uses chemicals or proteins made by the body's own cells to activate the body's defenses against a cancer. Also called immunotherapy or biological response modifier (BRM) therapy], also called biological response modifier therapy (BRMT), uses chemicals made by the body's own cells in order to activate the body's defenses against cancer. Many biological therapies are still experimental, but research is being done to develop and improve them. Scientists and doctors hope that they will soon be able to treat most forms of cancer using these therapies, combined with treatments like chemotherapy and radiation therapy. In one kind of immunotherapy [A form of biological therapy that stimulates the immune system to fight and kill cancer cells. Some forms include cytokine therapy, monoclonal antibodies, and tumor vaccines] chemicals called cytokines [chemicals produced by the immune system that stimulate white blood cells to attack and kill viruses, bacteria, foreign cells, or cancer cells] are used to activate white blood cells. Sometimes, when the immune system is activated in this way, it will fight and kill tumor cells. Two cytokines being used are called interferon and interleukin. Antibodies are proteins that help white blood cells fight off viruses and bacteria. Antibodies bind to foreign invaders and signal the immune cells to attack. Monoclonal antibodies Antibodies are proteins that help white blood cells fight off viruses and bacteria, by binding to foreign invaders and signaling the immune cells to attack. Monoclonal antibodies are antibodies that are made in the laboratory to bind to only one single type of molecule. They are currently being used to bind to tumor cells, either to signal to immune cells to attack, or to carry toxic agents directly to the tumor. are antibodies that are made in the laboratory to bind to only one single type of molecule. Many cancer cells carry proteins called tumor antigens on their surface. Because cancer cells are usually the only ones to carry these proteins, tumor antigens make good targets. Researchers hope that monoclonal antibodies against these tumor antigens will bind to them and signal the immune system to attack the tumor cells. Two approaches are being studied for treating cancer with monoclonal antibodies. In one, the antibodies signal the body's own immune cells to attack and kill the tumor cells. In the other, powerful anti-cancer drugs are linked to monoclonal antibodies which then carry the drugs straight to the tumor. This means that the drug is aimed directly at the cancer cells rather than at healthy tissues. The U.S. Food and Drug Administration (FDA) has approved Rituxan, a monoclonal antibody [Antibodies are proteins that help white blood cells fight off viruses and bacteria, by binding to foreign invaders and signaling the immune cells to attack] for treating lymphoma, and are considering approval of a similar drug, Bexxar. Rather than binding to proteins found only on cancer cells, these two antibodies bind an antigen found on almost all B-lymphocytes. This causes both cancerous and healthy, mature B-lymphocytes to be killed. But because the youngest B cells [White blood cells that make antibodies. Some forms of lymphoma are made of B cells] in the body do not have the antigen, they are not affected by the treatment, and can grow and mature to replace those that were killed during treatment. Another new immunotherapy is the use of tumor vaccines. In much the same way that a polio vaccine activates your immune system to fight off the virus if you are ever infected, tumor vaccines use a person's own tumor cells to activate the immune system to destroy the tumor. Angiogenesis inhibitors [Chemicals produced by the body which stop the growth of new blood vessels. Because cancerous tumors must have a supply of new blood vessels in order to keep growing, angiogenesis inhibitors are being tested as a treatment for lymphoma and other cancers] are chemicals that block the formation of new blood vessels. Tumors need to create a whole new blood supply in order to keep growing, so they cause new blood vessels to be formed. In mice, angiogenesis inhibitors have blocked the growth of many types of cancer. This highly experimental form of treatment has been successful in mice. Clinical trials are underway to test the treatment in people. In gene therapy [Treating a disease by putting good copies of a gene into cells. For cancer, this might include putting genes into the cancer cells that will make them stop growing out of control, or it might mean putting genes into the cancer cells that will make them self-destruct] pieces of DNA [The molecule that is used to build the genetic code in every cell. Genes are made of DNA] are placed into cells to correct something that has gone wrong with those cells, or to make the cells self-destruct. Because most cancers are now known to result from damage to genes that keep cells from growing out of control, gene therapy of cancer cells may someday be able to correct the problem or force cancer cells to destroy themselves. Gene therapy for cancer is still highly experimental. How Can I Help Treatment Go Smoothly ? Because many non-Hodgkin's lymphomas now have a good chance of being cured, anyone diagnosed with lymphoma should be referred to an oncologist as soon as possible. One reason for this is because treatments are constantly being improved and an oncologist is most likely to be aware of new and better therapies. The oncologist and the family doctor can then work as a team to arrange the best possible treatment and follow-up care. The medical team may also include a hematologist and/or a radiation oncologist. * Giving your doctor the most complete medical history that you can. * Telling your doctor about any side effects [Problems that occur due to treatment. Common side effects of cancer treatment are fatigue, nausea, vomiting, decreased blood cell counts, hair loss, and mouth sores] or problems you have during treatment. * Trying to eat right. * Taking care of yourself, including getting pain relief when you need to. * Following your doctor's recommendations, including follow-up and long-term care. What To Tell Your Doctor ? Before and during treatment for any form of cancer, your doctor will need to know about any medications you may be taking. This includes over-the-counter medicines for allergies, indigestion, colds, and pain relief and any vitamin, mineral or herbal supplements you may take. Remember to tell your doctor about prescription medication from other doctors. * Losing or gaining 10 pounds or more. * Severe itching or rash on skin. * Wheezing or any other trouble breathing. * Sores in your mouth or throat. * Feeling tingling in your fingers and toes. * Ringing in your ears. * Red dots under your skin. * Black and blue marks. * A fever of 101 degrees or higher. * Chills, especially shaking chills. * Redness, swelling, or tenderness, especially around a wound or sore. * Headaches or changes in vision. * Warm to hot feeling of an arm or leg. * Unusual bleeding, for instance from your gums or nose. * At least 5 servings of fruits and vegetables. * Protein-rich foods like chicken, fish, cheese or eggs. * Carbohydrates, found in breads, pastas, rice and grains. Whole grains like whole-wheat bread and pasta, and brown rice are more nutritious than processed foods like white bread, pastries, and sugary foods and will help your body recover sooner. * Soups can combine all of these and may be easy to eat. If it is hard to eat, try soft, soothing foods like milkshakes and soft sandwiches. Acidic or spicy foods or foods that are too hot or too cold can make eating more uncomfortable. Eating small meals more often can help you to meet your nutritional needs. Cancer therapies can make the mouth sore and prone to infection. Try to brush your teeth with a soft toothbrush after every meal. If your mouth is too sore to brush, try to at least rinse with water. Try to get plenty of rest. This will allow your body to heal and help fight infections. Avoiding people who have colds, flu, or other infections may decrease your risk of being infected. Dealing with cancer and cancer therapy can be extremely stressful. You may find yourself becoming depressed, or you may find yourself discovering new wisdom. Try to find emotional support and someone you can talk to about your feelings. This could be your family, someone in your church, a counselor, or a support group for cancer patients. For more information, go to Additional Sources of Information. Cancer can be very painful. While cancer pain cannot always be completely stopped, you do have the right to have relief from pain. Some people are afraid that if they take powerful painkillers they will become addicted. Some doctors and other caregivers also still hold this belief. Studies have shown that people who take pain medications in the right way, for real pain, rarely become addicted. Being able to keep pain under control actually makes people less likely to become addicted. Other studies have shown that severe, prolonged pain is actually harmful to your body and its ability to heal. Even if you have to take pain medication for a long time, this does not mean you have become addicted. In addition to pain-relieving drugs, techniques such as relaxation therapy, hypnosis, visualization, and massage can also help ease pain. Discuss these with your medical team. Be sure to discuss pain relief with your doctor if and when you need it. Try to work with your medical team and play an active role in your own care. Simply feeling in control of your situation can often do a lot to help ease pain. If you feel that your medical team is not allowing you the medication or other treatment that you truly need for your pain, you may want to discuss the problem with a counselor or seek a second opinion from another doctor. Because lymphomas can recur To occur again, to come back. Even when lymphoma appears cured, it may recur. even if it seems that they have been cured, it is important to have checkups every few months even after you have finished your treatments. Treatments for lymphoma can be toxic and there is always some chance that they will cause medical problems in the future. Staying in touch with your family physician and reporting anything that concerns you in between follow-up visits may improve your long-term outcome. If your child has been diagnosed with lymphoma, call your child's doctor whenever you have questions. If you are unsure whether something should be reported, discuss it with your child's doctor. * A fever or other sign of infection, or just doesn't look well. * Exposure to a contagious infection, especially chickenpox or measles (unless your child is known to be immune from prior exposure). * Persistent headaches, pain, or discomfort anywhere in the body. * Difficulty in walking or bending. * Pain during urination or bowel movements. * Reddened or swollen areas. * Vomiting, unless you have been told that your child might vomit after chemotherapy Treatment with anti-cancer drugs. or radiation. * Problems with eyesight such as blurred or double vision. * Bleeding. In addition to obvious bleeding such as nosebleeds, signs of bleeding can be seen in the stools (red or black), in the urine (pink, red, or brown), in vomit (red or brown, like coffee grounds), or the presence of multiple bruises. * Other troublesome side effects of treatment such as mouth sores, constipation (beyond 2 days), diarrhea, and easy bruising. * Marked depression or a sudden change in behavior. Remember to check with your child's physician when your child is due to receive any kind of vaccination or any dental care. What Is The Outlook ? By choosing the best treatment, your doctors will try to bring the cancer into remission, so that no more cancer can be found and there are no more symptoms. The outlook for lymphoma and other cancers is measured in survival rates, or how many patients have been able to live for two years, five years, ten years, etc. before or after treatment. * Although high-grade, aggressive lymphomas are usually quite deadly without treatment, many can now be cured with proper treatment. * On the other hand, most low-grade, indolent lymphomas can be left alone for years. But, they usually prove to be very stubborn and surprisingly difficult to cure. They often return, usually within a couple of years after treatment. Repeating the treatment can then often put them back into remission, but they usually come back. * A lymphoma with a lower stage A measure of how far a cancer has spread throughout the body. Stages range from Stage I, which is a localized tumor that has not spread, to Stage IV, in which the cancer has spread to parts of the body far away from the original tumor. Stage I cancers have a better outlook than do Stage IV cancers. (Stage I or II) has a better outlook than one with a higher stage (Stage III or IV). * Absence of B symptoms Symptoms that some people experience when they have lymphoma. B symptoms are non-specific In other words, they don't mean that lymphoma is present for sure, but it should be ruled out if the symptoms last longer than a couple of weeks. B symptoms include: drenching night sweats, unexplained weight loss (usually more than 10% of total body weight), fever of more than 100 degrees F., itching skin, and unusual tiredness. . Here are some frequently asked questions related to Non-Hodgkin's Lymphoma. Q : What are some of the possible side effects Problems that occur due to treatment. Common side effects of cancer treatment are fatigue, nausea, vomiting, decreased blood cell counts, hair loss, and mouth sores. of treatment? * Central nervous system problems. * Blood clotting problems or excessive bleeding. * Mouth, gum, and throat problems. * Nerve and muscle effects, like tingling, burning, weakness, or pain in muscles or skin. * Effects on skin and nails, such as redness, rashes, itching, peeling, dryness, acne or increased sensitivity to the sun. * Radiation recall, when the skin turns red and may blister. * Kidney and bladder effects. * Temporary or permanent problems having children. Your doctor can give you information on drugs and other ways to reduce side effects. Q : What other types of problems is lymphoma likely to cause ? A : Even before treatment begins, lymphoma may cause anemia. Anemia can cause extreme fatigue. Lymphoma may also interfere with the immune system, making infections more likely. Sleep disorders, depression and anxiety are also common effects. In the advanced stages of cancer [A disease in which any of the body's cells begin to divide out of control, causing a tumor to form or too many of these cells to spread throughout the body], people often develop cachexia, in which they stop eating and develop profound fatigue and weakness. Speak with your doctor if you are having trouble with any of these symptoms. Anemia can be treated, and sleep disorders can often be helped with medications. Medications are also available to help with cachexia. Q: Are there other things besides drugs that can ease pain or the side effects of treatment? * Biofeedback, a technique for learning how to change your response to stress. * Visualization and guided imagery. * Transcutaneous Electric Nerve Stimulation (TENS), a therapy using electric stimulation of nerves and muscles to relieve pain. * Acupuncture or acupressure (acupuncture is not recommended for people receiving chemotherapy, as it may increase bleeding). * Skin stimulation (heat, cold, pressure). Support groups for lymphoma patients offer more information on learning about these techniques. Q : Can lymphomas occur in other parts of the body than the lymph nodes Small, bean-shaped organs located throughout the body along the vessels of the lymphatic system. The lymph nodes filter impurities from the body and store white blood cells that fight infection and other diseases. Clusters of lymph nodes are found in the underarms, groin, neck, chest, and abdomen. Also known as lymph glands. ? A : Yes, tumors can be found in other organs, such as the liver, the stomach, or even the brain. Sometimes tumors in organs are found even if tumors have not been found in the lymph nodes. Q : Are there alternative medicines (herbs, shark cartilage, etc.) that will work for lymphoma? A : So far, no herbal or other alternative therapy has been proven to help lymphoma. For this reason, and because lymphoma can be a life-threatening disease, the safest course is to have medical treatments prescribed and tracked by your medical team. If you decide to try alternative therapies such as herbs or homeopathy in addition to the medical treatments advised by your medical team, be sure to discuss all treatments with your doctor first. Some alternative therapies may interfere with your treatment, lowering their chance of success. Others may become toxic when taken with chemotherapy drugs. The National Cancer Institute (NCI) offers information on alternative therapies that have been used to treat cancer. This information describes the results of scientific studies on these therapies. The National Institute of Health (NIH) has also set up the National Center for Complementary and Alternative Medicine [Treatments that have not traditionally been used in standard Western medicine, and are not widely taught in medical schools. These may include naturopathic medicine (herbs and plants), homeopathy, traditional Chinese medicine, Ayurvedic medicine, and others] (NCCAM), which is conducting scientific studies on herbal and other alternative medicines. Q : Are new treatments for lymphoma being developed ? A : Yes. Many new therapies, or combinations of therapies, are being studied. Working with a trained oncologist A doctor who specializes in diagnosing and treating cancer. will help to insure that you receive the most up-to-date and effective treatment. Q : Would a clinical trial A research study that tests the effectiveness of new treatments in people. be right for me? How can I find out about clinical trials for new treatments for lymphoma ? A : You may want to consider enrolling in a clinical research trial. This is a study in which some patients are given the standard treatment for a particular type of cancer, while other patients are given a new treatment. Any treatment tested in people must first pass rigorous tests in animals. The National Cancer Institute (See Additional Sources of Information.) has an up-to-date list of ongoing clinical trials of new therapies for cancer. I Humbly want to use this medium to appreciate the good work of Dr Molemen in my life, i was Diagnose with Elephantiasis for some months, i have tried different means to get this Horrible disease out of my body but i could not get a total cure for it, i have taken different medications that was recommended for me by some health Organization, i always had faith in GOD that one day i will be cured totally from this virus, Well today i am happy and full of thanks to God that my dreams came through with the help of Dr Molemen Herb Portion, i was referred to Dr Molemen by a lady who testified of what Dr Molemen has done for her, that he was able to deliver her from Herpes, and also her father who was diagnose with Cancer, i had to message Dr Molemen due to what he has done for that Lady, he told me not to worry that he was going to help me get a solution for my Elephantiasis Disease, he requested for some of my Personal Information, and after which he told me he was going to send me a Herb Portion which i am to drink for some days, Wow after all the process and recommendation from Dr Molemen today i am totally cured from Elephantiasis Virus, i can boldly walk out to my friends, you can connect with Dr Molemen on: (drmolemenspiritualtemple@gmail.com) or call him at +2347036013351, Thanks Doc for your good work.